The longer you are involved with perfumes as a hobby, the more perfumes you get to test and own, the harder it gets to be excited by a random positive review for a perfume – either a new release or the one you just haven’t tried before. When it’s a review from a person I know (or “know”) I might get a lemming, especially when I know from the past experience that our tastes have enough intersections. But even if our tastes differ, I would have a hard time ignoring let’s say a 5-bone rating from Steve (The Scented Hound) or Birgit’s (Olfactoria’s Travels) “acute perfume fidelity syndrome“. If the same person – regardless of the tastes mapping between us – tells a story of a sudden love and a bottle joining their collection, those perfumes attract even stronger attention: if a fellow-perfumista splurges on a full bottle of some perfume, it must be good – right? But the highest recommendation and the strongest interest, at least for me, comes from those “Top X” lists. Think about it: somebody who has tried as many perfumes as you have, considers some perfumes best of the best – how can I not to be curious about those perfumes? With these thoughts I ran some numbers based on one of Olfactoria’s Travels’ Monday Question posts – Your Top Five Part V: Perfumes. The most popular perfume was also an easily predictable choice – Guerlain Shalimar. 6 people named it among their top 5 perfumes. What did surprise me was that Chanel No 5 wasn’t mentioned even once. Ormonde Jayne Woman got the second place with 4 votes. The next ten perfumes were named three times each: Amouage Lyric, Chanel 31 Rue Cambon, Frederic Malle Carnal Flower and Portrait of a Lady, Guerlain Vol de Nuit, L’Artisan Parfumeur Traversee du Bosphore, Mona di Orio Vanille, Neela Vermeire Creations Mohur, Parfum MDCI Chypre Palatin and Vero Profumo Mito. I know that tastes are very different, so I expect others to like many perfumes for which I do not care. But the fact that I haven’t even tried so many perfumes others love amazes me. How many of these are you familiar with? If you were to recommend me to try just one out of these 30, which perfume would it be? This entry was posted in My Stats and tagged most popular brand, most popular perfume. Bookmark the permalink. Almost any time is great here weather-wise – so let me know once you have any dates in mind. I think I might even have Oriental Flower sample in my stash (a blushing smiley): I’m usually getting all current mass-market releases and file them under “one day when I have absolutely nothing to test…” But if I can’t find it I’ll let you know – thanks! I may even have slipped some in in Paris, knowing me – I am a bit of a pusher where that one is concerned, hehe. SHL 777 Khôl de Bahreïn. You can read a review on my site if you’re interested. I got Hajasuuri hooked, and she saud shed consider getting a backup. It is the only iris scent I like, own, and wear, and you know my feelings about iris. I think you’d love it. It sounds very interesting – thank you for the idea (though, I must say, both the brand and the perfume name are tongue twisters). Have tried sixteen from the list. Can’t decide which to recommend from MCG Cinabre or PdF Roma Imperiale, both intriguing italians. It’s an impressive result. I wonder if it’s “European thing” (I don’t know how many of Olfactoria’s readers are from Europe though) or you in general tested more than I did. Italian brands aren’t represented too well here so I’ll take both recommendations. Wow, I have only tried 6 on the list and only own one Cinabre (which is really have to be in the mood to wear). I guess I have lots of testing that needs to be done! “Wow” was exactly my sentiment: I haven’t even tried them and people can’t leave without those! 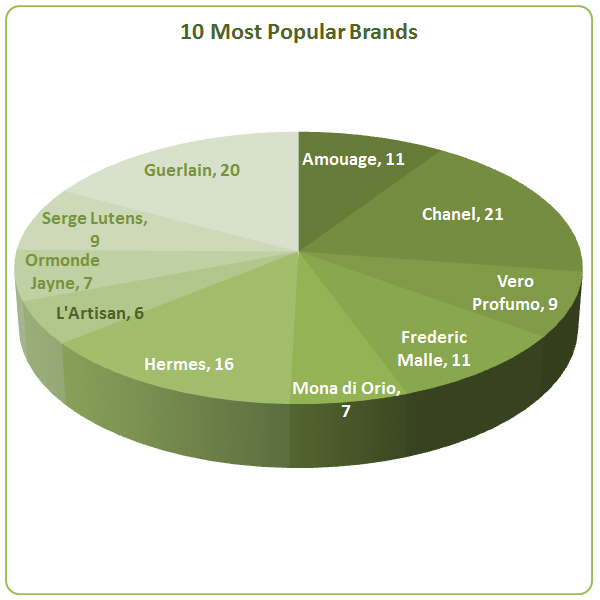 It’s interesting to see the most favorite brands resulting from the poll at Birgit’s place. Funny that none of the brands in the pie-chart is my favorite. Thank you, Lucas. I’m glad you like these: they are silly and completely useless but I enjoy working on these. I like at least half of those brands (and own at least a bottle from 8 of them). I’m familiar with about 8 on there. Out of those I would say that Musc Intense might be worth a try because it’s not nearly as musky or as intense as the name leads you to believe. I love Onda but not sure if it would be your cup of tea. Since the first two concentrations of Onda didn’t work for me, chances I’ll like this one are slim. Misc Intense – noted. Thank you! I have a few samples of those mentioned in your 30. For AMAZING maybe try Party In Manhattan. The price is ridiculous but the fragrance is killer. Bal a Versailles is another I adore. Al Oudh is like the softest and most even a little girl can wear it oudh ever. People keep referring to the price of Party In Manhattan (I read several reviews today) but it doesn’t seem that it’s the most expensive perfume out there, there are many other brands that are in that price range. It doesn’t make me like that more (nobody wants to pay too much) but I’m not shocked (especially if you look at their refills – EUR196/100ml). I am a cheapskate. Though I do have a few very expensive bottles of perfume at the AUD$200 mark I start to get freaked out at my own naughtiness. I own just several bottles that are super expensive, for the rest it’s usually just a decant, so I know what you mean. I was talking about prices not from the point of buying those perfumes but just as a comparison analysis. Yes, that makes sense Undina. I don’t know why Party In Manhattan seemed so outrageously expensive to me. I do remember thinking that I would eke out the decant instead. I have not tried many on the list, but here is one that I really like-Ferre. What a confusing line, because there are several perfumes with the tiniest variation on wording, all related to G. Ferre’s name. The one I have comes in a box the is white on top, and the paper of the white part is heavy and elegant and slightly wav-y looking, Textured. The bottom of the box is black. And it clearly states that it is Ferre. I bought it blind, and imagine when my surprise when I smelled it-it’s almost exactly like FM Iris Poudre. Slight differences, but the quality and staying power are great. It can be found online for $15 or less, and I wear IP too–so hard to tell them apart. I went a bit nuts recently at a sale, and bought 4 of the Huitieme Arts fragrances. I know I will need something for Xmas presents, and I live so far from any kind of decent shopping. So I wondered-I know that line did not receive lots of love-is t because it was too hard to find, or was it too expensive for what it was? I paid about $50 for each of them-at that price, would more people love them? Or have I just added a more to the list of things you have not tried? I don’t think I’ve ever tried any of Ferrer’s perfumes but now I’m very curious since not only I like and wear Iris Powder but I “found” two other perfumes that remind me of it (if you’re curious, check the Deja Vu category, I did two posts about it). Huitieme Arts’ mystery is easily explained: there are not that many US stores that carry the line. I saw it only once when I visited New York. For $50 I would definitely get at least a couple. Definitely Manguier Métisse. Raining… I miss rain and hopewe’ll get some this Fall. I’ve tried on some of these, but by no means all. The Vero Kern ones are both lovely and Scherrer 2 as well. ELdOs FIls de Dieu I have tried (and I’ll gladly send you sa sample if you’re inclined to sniff for yourself!). Bal a Versaille is, of course, a classic. If I was to recommend one, I’d go for Patricia de Nicolais Musc Intense. It’s very summery and easy going. Thank you, Sigrun, I appreciate the offer but I think I have somewhere a sample of FIls de Dieu – I just need to find it. I’ve been curious to try Bal a Versaille for a while but I’m afraid I won’t like it. Musc Intense – noted. Thank you. I have only tried three of these, and I do like Habit Rouge very much but I can see how it might not be everyone’s cup of tea. I imagine, cup of tea or not, all of them are worth trying! I plan to go through at least half of this list and I’ll start with those that commenters here recommended. Habit Rouge – noted. Thank you. I’m responsible for a few on that list, I guess. My choices were mostly based on an emotional connection with the scents. To name 5 fragrances is difficult enough, and my approach was simply to name those close to my heart. We can grow to love a perfume as much as anything else. Whenever I have to make one of these lists I take it very serious – as if I can be kept to it and use just those perfumes I named. So I understand an emotional approach to selecting one’s “best of”. Caron was on the list: two people named Tabac Blonde as their favorite perfume. Caron is a brand that isn’t widely available in the U.S. if one lives outside of New York – so I’m not surprised it doesn’t make to the top N brands. I tried just a few of their perfumes so far. Ah, good point. Their scents are widely available in mail order but I realize not in retail. The only one I am familiar with / wore several times on the list above is SHL 777 Khol de Bahrein and it was Kafka who got me started on the line…I got a largish blind “sample” (euphemism for “partial bottle”) on the strength of her review :-) and I LOVE it. If I get my lazy behind to Osswald, I can sample the entire line. I have a decant of Cuir Cannage but have not tried it as yet; I have samples of or had smelled on paper 8 others. If I had to pick one for you to try, not counting Khol de Bahrein since I know you’ll love it (may I be that presumptuous? ), it would be Heeley Iris de Nuit because I am curious about it myself having never tried it consciously and would love to compare notes! Heeley is one of the brands that somehow stay under the radar for me. I have no objections against it, just somehow manage not to try their perfumes – even when I come across them. But next time if I see Iris de Nuit I’ll definitely give it a try! I’ll try Habit Rouge if I get a chance. I thought it was discontinued. And a problem with those is that nobody carries them any more. But I’ll see what I can do and report back. Nice, I enjoyed reading these statistics. I’m surprised too that Chanel No.5 didn’t make anyone’s favourite list, especially since many consider it to be a “classic”. I guess classic doesn’t necessarily translate to favourite. Or it could simply have fallen just outside of the top few, while still remaining loved. I’m glad to report that I’ve smelt 22 of the 30 in your list, so yay! But it’s sad that I don’t even vaguely remember how some of them smell, so I’ll probably have to revisit them. I was so upset for Chanel No 5 that spent the whole day wearing it – for the first time ever. I tried it multiple times before and it’s not “my” perfume. But today for whatever reason I wanted to wear it. Luckily, I had a sample – both for the current version and the one from 80s. This may just be the most fascinating Entertaining Statistics post ever. I’ve tried 11 on the list and think you would like Mito Voile d’Extrait the most. I went right off Cuir Cannage when I tried it on the skin the other week. Thank you, Tara. 11 is still an impressive number (though now I regret not including an attachment with a complete list of 141 perfumes: maybe those who tested more than I on this 30-perfumes list would have a smaller number in the remaining 111? ; -)). Try Habit Rouge (I would pick the EdT). It’s not discontinued, actually you can find it in any airport tax free. And then: Eau Sauvage! It’s good to know that it’s available at Duty Free. I’ll make sure to test it the next time I’m at an airport – thank you for the information. As to Eau Sauvage, I have no idea how I managed not to try it. Somehow it just slipped away. Wow of that list, I think I’ve tried about fifteen, what a surprise! Anyway, what should you try? If you don’t hate vetiver, Vetiver Pour Elle is lovely and slightly woody and tart, which you might like. You might also enjoy Unspoken which is an elegant chypre with some rose and iris. It’s not on the list but I bet you would like Caron’s Alpona, which is grass green, fresh, only faintly herbal and floral, and seems appropriate to you. I have some if you want to sample any. I like vetiver – so I should add this one to my “to try” list. Roja’s perfumes seems attractive to me as an idea but those couple that I tried so far weren’t “love” – and they should be to justify the price. But I will be testing those perfumes whenever I get a chance. Caron is, mostly, terra incognita for me so I’m taking any recommendations (and ready for a swap for samples). Let me know and I’ll send anything you like as I do happen to have a lot of Carons! I always lots your entertaining statistics, Undina! You’ve never tried Eau Sauvage or Fils de Dieu? Oh mon dieu! I have actually never heard of The Party or Party in Manhattan, but I live in Manhattan and I like to party so that one would go to the top of my list. I found Fils de Dieu sample! Testing :) (not that I’m refusing a care package, don’t get me wrong ; -) ). I do not mind paying a lot for a bottle of a perfume that I absolutely loved. But I’m not prepared to pay a lot for a sample of an expensive perfume that I might not even like. So we’ll wait to crash the party once it’s somewhere around – right? Jesus. I just saw that The Party in Manhattan is 320 euro. I think I’m going to have to stick with The Party in Brooklyn.